Jaguar is building six exact duplicates of XKE racers built in the 1960s. Jaguar has announced it will complete a project started in 1963 by manufacturing at its plant in Castle Bromwich, England, six all-new XKEs with lightweight aluminum bodies. The UK sports car maker had always planned to build 18 lightweight E-Types for racing, but just 12 were completed. The six remaining chassis numbers were set aside and never used. The six new cars will be exact duplicates of the original 12, right down to the 3.8-liter inline six-cylinder engines and four-speed gearboxes. 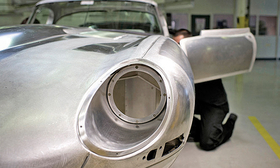 The cars, under construction now by Jaguar craftsmen, will be sold, but no prices have been announced. UK media reports have suggested prices of about 1 million pounds 1.23 million euros) for the cars. The automaker says the first car will be unveiled in the summer. Production is likely to last throughout 2014 and into 2015. A source close to the project says the plan is to debut the "new" XKE in August at the Pebble Beach Concours d' Elegance in California. This is the first time Jaguar has reproduced one of its classics.